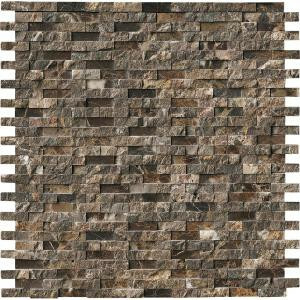 With its unglazed finish, the MS International Emperador Splitface 12 in. x 12 in. Brown Marble Mesh-Mounted Mosaic Tile makes an understated but stylish impact on your walls. Designed for indoor use, this natural stone wall tile has water absorption of less than 0.5% and is certified by the Marble Institute of America for its genuineness and uniqueness. 1 square foot per piece, each piece sold individually. Piece weight is 4 lbs. Buy online MS International Emperador Splitface 12 in. x 12 in. x 10 mm Marble Mesh-Mounted Mosaic Tile EMP-SFIL10MM, leave review and share Your friends.